⇧ Covering just 4 acres, Don-Bur started with 70 staff members. The name "Don-Bur" derives from the name of its founder; Donald Burton. 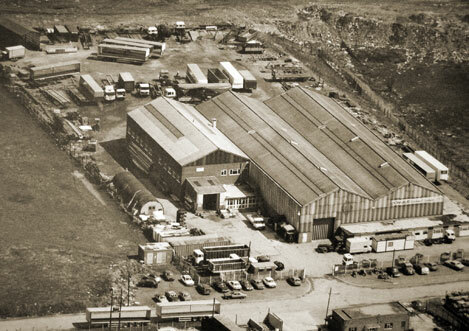 In 1981, as part of one of the first management buy-outs, Welford Truck Bodies became Don-Bur, which was located on a 4 acre site with just 70 members of staff. Today, still based in Stoke-on-Trent in the heart of England, the Don-Bur group of companies has 6 divisions, all under the umbrella of Don-Bur (Bodies & Trailers) Ltd. The group now has an annual turnover of circa. £50 million. Don-Bur (Bodies & Trailers) Ltd now covers some 18 acres, much of which has been developed into covered manufacturing and assembly bays. Around 500 staff are now responsible for the impressive production rate of 1,500 units per annum covering anything from 7.5 tonne rigid bodywork to complex hydraulic moving deck trailers. Don-Bur's main manufacturing plant now covers 18 acres and employs some 500 employees. The group has 6 vertically-integrated divisions. The rate of development is testimony to the firm's ongoing commitment to developing innovative bespoke solutions. During the past decade, Don-Bur has continued to build on its strong ethics of quality and value.